When art deals go wrong they generally go wrong due to the money involved. Virtually anyone who collects art can tell stories of paying too much for art, for being over-committed and experiencing buyer (or seller) regret. Most of those deals generally involve a few hundred dollars, sometimes a few thousand and the extraordinary ones can run into the tens of thousands. There are avenues open for recourse, but what can a person do when they’re owed a million dollars for an art sale and the buyer was none other than Steve Geppi? If you’re the family of veteran artist Bob Montana you do the obvious thing – you file suit and sue. Bob Montana was one of the first, if not the first, artist to draw Archie, back in the days of Pep Comics in the 1940s. 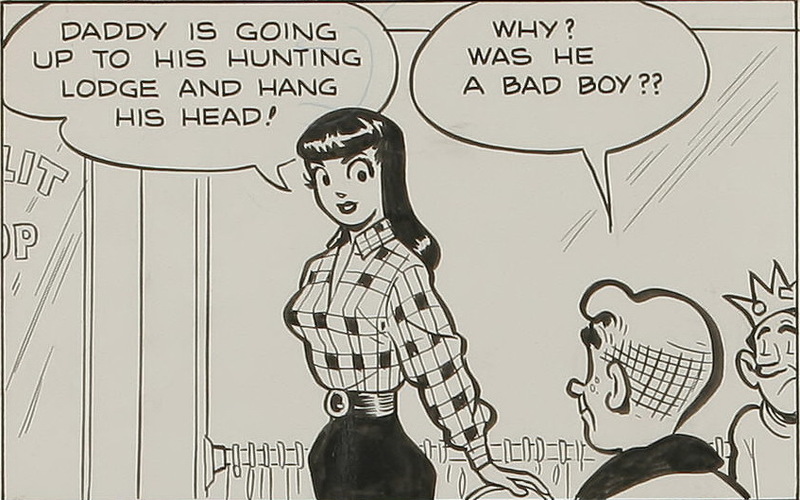 Montana then went on to draw the syndicated Archie strip, both dailies and Sunday strips, and managed to hold onto almost all of his original art, an amazing feat considering the relative scarcity of original art from the Golden Age of comics and newspaper strips. 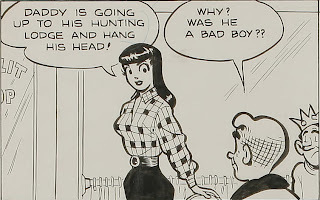 Montana first drew Archie in 1941 and continued to illustrate the syndicated strip until he passed away in 1975, another amazing feat, ensuring that he remains one of the longest serving artists on a single title. In a wise move Montana’s family held onto the original art, thousands of pages and strips, only releasing the occasional page into the marketplace, but retaining the bulk to ensure that the collection remained relatively intact. This caused a demand for Montana Archie art, as there wasn’t that much of it to go around – in art collecting circles demand is often linked to scarcity of available art - a modern day example would be Walter Simonson. Simonson’s Thor art is so sought after is because he has held onto almost all of it and refuses all offers to sell. 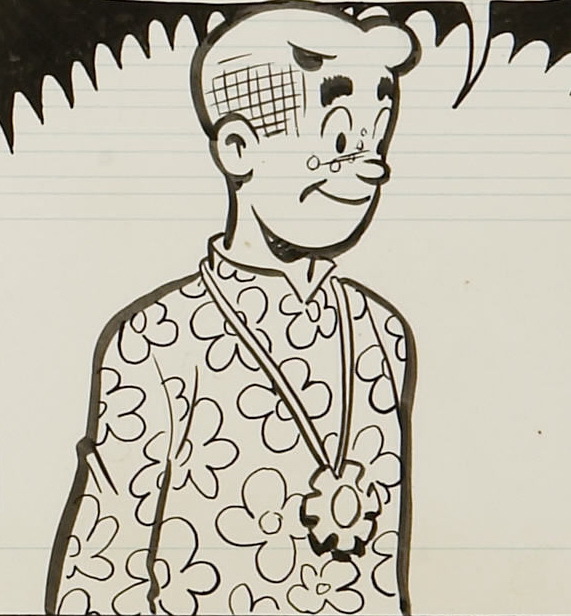 Another factor for Montana’s family is that in the mid to late 1070s, original comic book art was fairly inexpensive, and it’s doubtful that there would have been much demand for Archie originals at that point in time. On the other side of the fence is Steve Geppi. Geppi founded Diamond Distributors and soon established a monopoly for comic book distribution worldwide, both by attrition and other means. Diamond controls the comic book industry, they decide what books will and will not be carried, and independent companies, such as Claypool, have found themselves shut out of the main distribution channels because they don’t make enough of a profit for Diamond to bother with them. This has assisted the gradual decline of the comic book market as less competition is available, which means that the big four publishers – Marvel, DC, Dark Horse and Image – are able to saturate the market at the expense of smaller publishers. The Internet has gone a fair way to redressing this situation, however if you can’t get your book distributed through Diamond then you might as well forget about it. Diamond, and Geppi’s, monopoly has gone unchallenged for nearly two decades now, an incredible feat when you consider that other monopolies, such as Microsoft trying to eliminate Netscape, have been successfully challenged in courts of law. Nobody seems willing, or able, to challenge Diamond. As Diamond grew and wealth began to pour in, Geppi established other companies – Gemstone Publishing, which handles the Overstreet Price Guide and also published vintage Disney reprints, Geppi Entertainment Museum, which was a physical museum devoted to pop culture and comic books, Hakes Americana, an auction house and Baltimore Magazine. 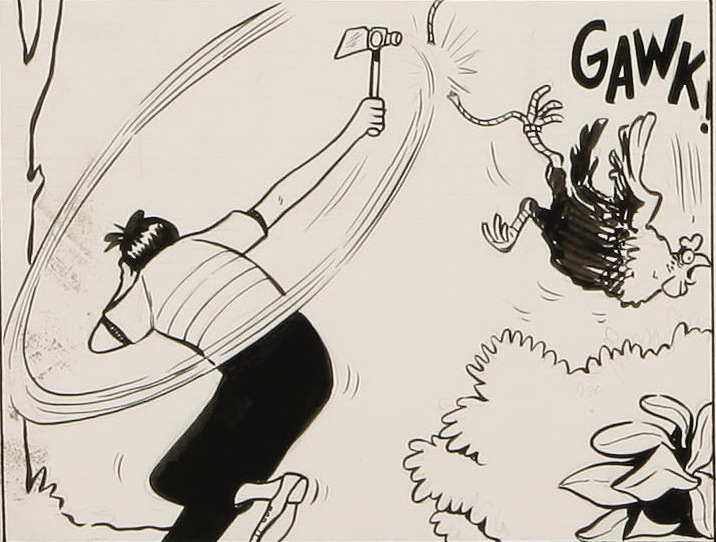 Geppi also began to pay premium prices for rare items, including paying six figure sums for original (Walt Disney artist) Cark Barks paintings which featured Donald Duck and Uncle Scrooge. Not everything Geppi bought was for his own collection or for his museum though. Geppi would routinely buy collections for the purpose of cherry picking, breaking up and then on-selling the rest of the collection in an attempt to either recoup his costs, or to lessen the original buying price somewhat. Geppi didn’t get rich by being totally stupid. In additional to the grading system, Weist checked each individual item before pricing it. For his work Jerry Weist pocketed a cool $100,000. The actual value of the art would later be disputed by Geppi. It’s worth bearing in mind here that Jerry Weist was no idiot. Weist had been active in comic book fandom since the early 1960s, he’d been active in retailing since the early 1970s and was an internationally recognised expert in the field of original comic book art, having worked at Sotheby’s as a comics consultant from 1990-2001. 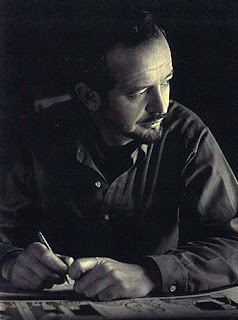 During his time Weist worked with some impressive artists in his ventures to assist them with the sales of their original art and other items, including Al Feldstein, Jerry Siegel, Murphy Anderson, Steranko, Stan Lee, Jack Kirby, Bill Gaines, Ray Bradbury, Burne Hogarth, Frank Frazetta and R Crumb, amongst others. He also wrote the first original comic book art price guide. Weist sadly passed away in January 2011. Shortly after Weist completed his work terms were agreed to and a contract drawn up. The contract called for the Montana’s to retain ownership of the art in the form of scans and the family also retained all of the rights to the art. Geppi decided to complete the purchase of the art through his Diamond International Galleries company because he intended to resell either the entire collection, or a large part of it in order to make a profit or to offset the final cost. As Geppi himself would later testify, under oath, the way he’d decide if the purchase would be through his company or him personally was by the following criteria. “Usually the criteria for determining that was if I would buy something that I felt I was going to hold for more than a year and hence be eligible for capital gains,” said Geppi, “I would do it under the auspices of Steve Geppi personal. If it was something we were just buying as inventory to turn over or hopefully sell, it was bought under the auspices of Diamond International Galleries.” In this case Geppi was going for the capital gains as the purchase price was high. Diamond International Galleries and the Montana’s then settled on a payment plan which called for Geppi to pay the $1,000,000 to the Montana’s in the form of four annual sums of $250,000 each, plus an additional $100,000 to Jerry Weist. Upon receipt of the first payment the art would be transferred to Geppi. The contract also contained provisions denying the destruction of the art, maintaining the integrity of Bob Montana’s name, giving limited rights and representation and, most importantly, Steve Geppi himself gave his personal guarantee that the payments would be met. 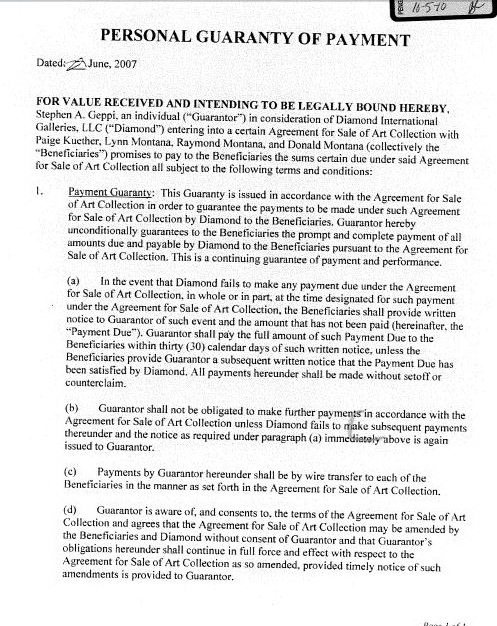 This latter provision was executed in the form of a separate ‘Personal Guaranty of Payment’ contract, a four page document that would see Geppi personally liable for the full purchase price of the art. 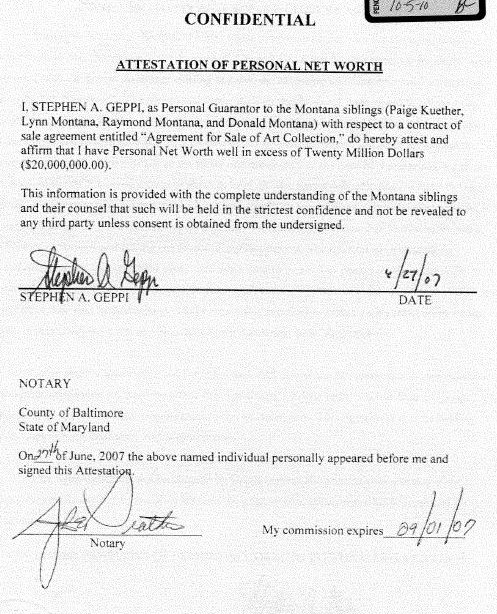 Geppi assured the Montana family that he was more than capable of paying the $1,000,000 and provided the family with an ‘Assestation of Personal Net Worth’, within which he stated that his personal net worth was in excess of $20,000,000. Geppi signed the document and it was duly notarised. However in the event of late payments, a 5% interest would apply, and in the case of a default the entire amount outstanding could be accelerated and the Montana family would retain a security interest in the collection. It’s doubtful that the Montana family thought things would come to that. Geppi made the first two payments, on time, and took possession of the collection. He then put it on display and began to break it up and offer it for sale, using eBay, Heritage Auctions and through direct contact with other interested art collectors. However the market was coming into a depression, partially due to the GFC, added to the Sub-Prime Mortgage crisis and high unemployment in the USA. 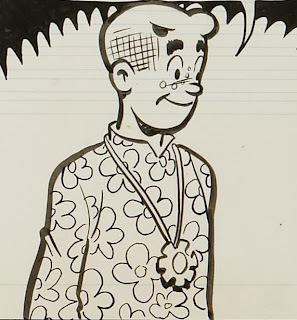 Added to the limited appeal of high end Archie art (it really is a niche market), prices realised by Diamond Galleries were well below the original valuations by Jerry Weist. And there was another, more important factor coming into play – at the point of purchase Steve Geppi and Diamond were hemorrhaging money to the point of legal action, not that he told anyone. Geppi was rapidly finding that more money was leaving Diamond than what was coming in from its various sources with the result that his net worth had plummeted to a fraction of its original value. While this didn’t leave him destitute, it did have the effect of leaving Diamond hovering on the brink of bankruptcy. Geppi elected to simply cry poor and not pay the remaining $500,000 owing to the Montana family. The Montana family began to exercise their right to get the outstanding cash. The first step was to send a letter to Diamond and Geppi asking for the money. For their part the Montana’s instructed Geppi not to sell any remaining items from the collection and also asked for an inventory of what art remained in Diamond’s possession. Nearly a month later Geppi, through his legal firm, replied that he was no longer in a financial position to make any further payments and that no more art would be sold, current auctions through Heritage would be pulled and the remaining stock would be fully inventoried. The Montana family duly replied that they were now exercising their legal rights to accelerate the full payment, under the terms of the contract, and followed that letter up a month later advising that Geppi, under the terms of the contract, would now have to place the remaining $500,000 into escrow unless an alternate arrangement could be worked out. By September 2009 Geppi and Diamond had two solutions that they put forward. The first solution involved the return of the remaining art for the cancelation of the contract. This solution, Geppi was sure, would see the Montana family receive approximately $1,000,000 worth of art essentially for the $500,000 that they had yet to receive, and were unlikely to ever receive. The second solution would see the Montana family again retain ownership of the art, but allow Geppi and Diamond Galleries to continue to sell it, with proceeds going to the Montana family, less commission. The Geppi lawyer again reinforced the fact that Geppi and Diamond were unable to meet the $500,000 financial agreement. 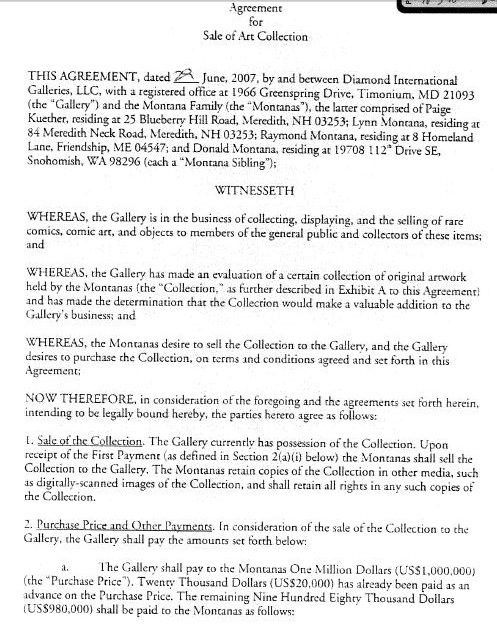 The Montana family, faced with two solutions that they didn’t feel were agreeable, decided to file suit against Diamond International Galleries and Steve Geppi, asking for the outstanding amount, plus interest, be paid and damages awarded, for breach of contract. When asked about why the payments stopped Geppi was more forthright. “There was no funds (sic) sufficient to pay it,” he said. “There were no funds available. Diamond International Galleries did not have funds available.” When asked why he had no funds, Geppi simply said, “Credit officers have been asking that questions (sic) for years.” The Montana’s legal representative pressed further asking about Geppi’s net worth. Geppi stated that he did indeed have a net worth in excess of $20,000,000 when he signed the contract in 2007, but as of 2010 his net worth was around the $1,000,000 mark. If true then this is an amazing fall for Geppi. Geppi insisted that the only reason the final $500,000 was not paid was down to, “No funds.” For Geppi it really was as simple as that. No other reason was offered, no other reason was required. However another accusation that Geppi filed was that other items were shown to him by the Montana family but were not included in the final inventory. Faced with Geppi's answers the Montana family asked for a trial by jury, something that Geppi was keen to avoid. Part of Geppi’s fall from grace is down to judgments that have been filed against him. At the time of the Montana suit, Geppi was facing a $15,000,000 personal judgment, along with other million dollar loan defaults that other banks had brought forward, resulting in amounts totaling over $20,000,000. His then current mansion, as of 2010, was 100% mortgaged and has since been put on the market and sold by his bank but at no point was either Geppi or Diamond International Galleries facing bankruptcy proceedings - yet. Geppi had built a house of cards over the years, via loans and promises, and once the GFC hit, the house began to collapse. Geppi did admit that parts of the collection had been sold, but did not know which pages or strips exactly, nor was he aware of where they’d gone, or indeed where they’d been sold. When shown the original inventory, Geppi still came up blank. The Montana family, by this stage, were ready to settle, after all the deposition had revealed several factors, neither Geppi nor Diamond International Galleries had enough money to meet their contractual obligations and with other lawsuits and judgments pending, there was every chance that, eventually, Geppi and Diamond could be placed into receivership and the remaining art sized. The Montana’s asked for a complete inventory of what art remained and what prices were realised for the art sold. Geppi countered this by saying that; incredibly, no records of art sales had been kept. All that could be provided was a list of what remained. The Montana family advised the court that a settlement was nigh and sat back and waited. By February 2011 Geppi and Diamond had inventoried over one thousand remaining pages and strips, and a settlement was pending with papers being drawn up. On the 14th of March, 2011, the court was advised that a settlement agreement had been reached and that both parties, “…agree and stipulate that all claims and affirmative defences in the above-captioned matter are hereby dismissed with prejudice and without costs. The parties waive notice and all rights of appeal.” The terms of the settlement were sealed, but I’d expect that the settlement involved some form of a payment to the Montana family and the return of the remaining art. So where did it all go wrong? When you look at the prices that Geppi paid for the art against the prices that he eventually realised you can clearly see what happened. 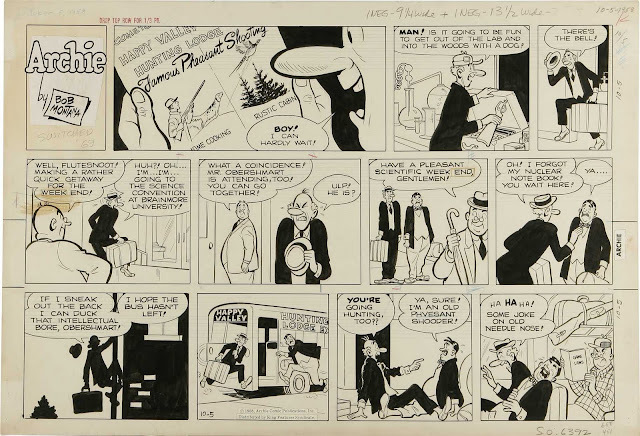 To take one strip at random – a strip dated 04-11-1951 was valued at $2,000 in the original Jerry Weist valuation, yet the same strip sold at Heritage Auctions on August 15th, 2010, for a mere $286 – just over 10% of the original valuation. An examination of the remaining strips and Sunday pages show a very similar pattern. Strips from 1970 that were valued at $80 each sold, on average, for around $50 a shot, not a bad return, but when you average that out over 99 strips you can see the potential for a massive loss. The same applies for strips from 1968 (Weist valuation $100 each, sold at Heritage for an average of $70), 1969 (Weist: $90 each, Heritage: $70). To be fair some strips sold for above the original valuation price, but these were too few and far between to make a real difference. Other prices show that Weist was not far from the mark. 1959 Sunday strips that were valued at around $400 each sold for around those prices at auction. However one strip, dated 08/02/1953, was valued at $1,500 by Weist and yet realised a mere $567 at auction. This is the risk of making a bulk art purchase – you have to take the bad with the good, and eventually the purchaser is faced with the realisation that some of what has been bought just won’t realise the initial valuation and will need to be dumped, to use a horrid term. In this case though, Geppi got in over his head by buying a complete collection that he could not on-sell for the profit that he expected, nor did he have the means to service the purchase once his finances began to implode. 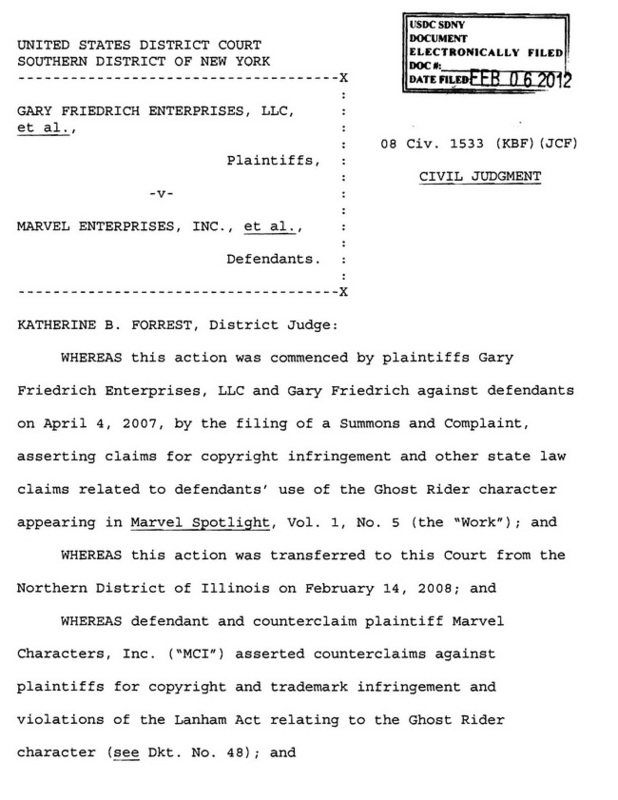 At least this case has had a resolution, of sorts, and there is Bob Montana art out there for those who wish to own it. The only trouble for dealers is that anyone who wants a Bob Montana original probably now has one, so selling more might prove to be more difficult than first imagined. You have to wonder how long it will be before Diamond goes belly-up. The core business (comic book distribution) seems to be sinking month by month with comic book stores shutting at a quickening pace. A few years ago there were nine comic book shops in a tri-city area near me. Now there are two. In addition, the big two comics publishers, Marvel and DC, have began the push to digital distribution. There will come a point where enough of the market has switched to digital that distribution of printed monthlies will no longer be a viable business. Great article! Thanks for writing it up! Seems like everyone lost on this deal. The Montana family had an unrealistic appraisal that lead to high expectations, which were not met when the sales values proved wrong. Mr. Geppi overpaid and then incurred financial problems, as so many others have in this economy, so he could not pay his debts. At least he was honest enough to admit he couldn't make his payments. Many don't. A sad story for everyone. Interesting article, but there is at least one factual error. Geppi didn't "establish" Hake's Americana. Hake's was founded by Ted Hake, one of the nicest guys in the collectibles business, in the 1960s. It was around for at least 35 years when Geppi bought it. Incidentally, Geppi also bought Morphy's Auction in Denver, PA at nearly the same time, but has since reverted back to its original owner. It was said at the time that the matter was put into abeyance, and *could* (in theory) be re-opened at any time. Good article, but if I understand it correctly, 1970 strips valued at $80 selling for $50 is a $10 profit each, since Geppi was only paying 50% of the valuation. 1968 strips valued at $100 each would make $20 profit at $70 and, 1969 strips valued at $90 each would make $25 at $70 each. Of course there were other fees, but Geppi should have at least broken even. But a 20% return doesn't even come close to paying the overhead on this collection. The $100000 paid to Weist, and just storage of the items. The family was the true winners with the $500,000 plus the pending return of the rest of the art that can be sold through heritage or other auction houses. Great article! The ridiculous claim that there was no record of what pages had been sold and what they went for makes it pretty hard to feel any sympathy for Geppi. Pretty gross! For everyone to know, this article is packed with misinformation and if I were the person who wrote it, I'd be worried about the consequences of it when it comes to the law. It may suit the writer to gather more information before spreading misleading information on the internet. Not smart. Give someone a computer and all of the sudden they think they are an investigative reporter. First up, if you're going to leave a comment like that then at least have the guts to sign your name to it. Second - the information was drawn from court documents, contracts, correspondance between Geppi and the Montana family and Geoppi's own deposition, which, frankly, I'll post later just to show that it's all on the level. Thirdly - exactly what is 'misinformation' in your view? I have nothing to worry about with this article, certainly I do not worry about the consequences when faced with accusations from a coward. First of all, thank you whomever you are the posted that comment. Second, although there is factual information through court documents and such, the picture this article is trying to paint is that Steve is not a man of his word and broke. I can tell you without a doubt that he IS a man of his word, and always has been as well as he is not broke. We all have seen the economy take a huge hit, and there is little any of us can do about it. Bottom line is that Diamond IS and will continue to be a strong company. Anyone who believes Steve's net worth (which is none of their business) is 1million or less, is a complete fool. Use common sense. Do you think Diamond would still be around if his worth fell that low? Is anyones net worth what it "used to be"? Truth is, and I will put emphasis on TRUTH, is that if you look at that deal Steve tried to do everything he could to make it right in the end. He really lost on this deal, but didnt try and screw anyone and he didnt whine about it, and in the end he made it right. There should be a follow up article on how many people have not paid HIM. That could keep you busy for A LONG time Daniel. Also, I want it out there that NO ONE is dragging Jerry Weist's name through the mud on this. Jerry was a good man and will be missed. I know its always easy to hate the guy at the top and root for him to fail but in this case the guy at the top is trying to do whatever he can to help this industry that we all love. I have said before Steve built this business because it is his passion and he loves it. This wasnt handed to him, he is the guy you WANT in that position. As for the article itself, Daniel. You seem to have put quite an effort into it. There are some inaccuracies in it, but its written from your interpretation of something you werent present for. So that is to be expected. I wont point out what they all are just because I dont feel like giving you reason to write more on the subject. I wish you all the best in what you do Daniel. By the way, are you on Facebook? I'd like to put a face with the article. Feel free to give me a shout on there. In closing my father is a good man, with a great heart. If you have never had a chance to know the man than you are missing out on a loyal friend. "6' 3" 230lbs of Tattooed Collector"
Josh, thank you for your comments - you're always welcome to put anything together and I'll be more than happy to post it here - the other side, so to speak. It's an open invite for anyone really. I'm sure your father is a wonderful man, and yes, there are always two sides to the story. My intention was to show how deals do go wrong, especially high end deals. I did point out that a settlement was reached, and that the action was also settled. As for Steve's net worth, it was Steve himself who, under oath, stated that it had dropped from $20,000,000 to around the $1,000,000 mark - you can read that in my other post that has his full deposition. Steve did himself no favours by stating that he stopped paying because he had no funds. The way that was presented, both in the deposition and also in the court documents, it appeared that Steve had run out of money, simply did not want to pay and just decided to cancel the deal. As I pointed out, that wasn't the case, there were other factors involved. I didn't expect everyone to read the post fully, and, with all due respect Josh, I wouldn't expect anyone connected to Diamond or Steve to see this as anything but an attack on Steve. It wasn't. How others perceive the article is up to them - we all see/read things differently. "6'3", 98 198lbs, two tattos, and I collect some stuff"
If your Dad is worth so much more money than he stated in court testimony, Josh... Then he is guilty of perjury and still owes the Montana family $500K plus interest. Not having a detailed report on what art was sold and then returning the rest? That's not making it right. That amateurish and patently ridiculous. And according to the court documents filed by your father's representatives, Weist's accuracy was called into question-- with allusion of impropriety and that Jerry gave the Montana family a favorable evaluation at your father's expense. You can claim all this is false but few if any will believe you. Daniel's article is far too well researched for anyone to believe anything but the truth.